The Nokia 808 PureView comes with all the essential accessories in the box. Ours came with a rather big charger to be used with a data and charging USB cable. We would've liked the stylish round chargers of the N9 and the Lumia line, but it's not a big deal. The stereo headset has a Call key built-in and comes with a choice of three different sets of earbuds of different sizes. An NFC sticker and a leather wrist strap with suede padding complete the contents of the box. Here's the Nokia 808 PureView in all its glory. It's not exactly fresh out of the gym, and the massive camera bump makes it look like it's been in an accident. Multiple accidents? It's certainly not a bad-looking fella, though. Nokia are sticking to the classic white and black, and red for special occasions, we presume. No fancy paintjobs like pink and lime. Also gone is the full-metal body of the N8. The all plastic build is not necessarily a bad thing, considering that at 169g the 808 PureView competes in the super heavyweight division. Plastic was definitely the way to go here. The Nokia 808 PureView has a surprisingly coarse finish that almost feels like machined metal, only not as cold. It is nice to the touch and has great grip, which is a must for such a hefty, and top-heavy, piece of gear. We don't miss the aluminum unibody of the N8 because, believe it or not, the 808 PureView easily puts any metal-clad phone to shame. The feel is solid, bordering on lethal. The Nokia 808 PureView desperately lacks sophistication but it doesn't feel like it'll break in your hands. It's not hard to guess that this kind of camera will require plenty of extra space. At 123.9 x 60.2 x 13.9 mm, the 808 PureView is just a millimeter thicker than the Nokia N8, but that's not taking into account the large hump at the back. At its thickest part, where the camera is, the 808 PureView is 18mm deep. Despite the size and weight, the device doesn't feel weird in the hand. It didn't take long to learn how to balance the top-heavy phone in portrait. That's where the grippy finish of the rear was most welcome. One scenario where it's not the most comfortable of handsets is typing in landscape mode. And even that's not too bad. Above the display we find the secondary camera for video calls, alongside the proximity and ambient light sensors, and a centrally placed earpiece. Keeping up with the times, the 808 PureView packs a 4" AMOLED display, with a layer of Gorilla Glass for extra protection. It's a nice choice for screen meant for viewing photos. So, assuming at some point you will stop ogling the monstrous camera at the back, the front is where your attention will be. Unfortunately, Nokia could've done better than nHD resolution. 360 x 640 pixel screens weren't exactly top of the line two years ago, and they most certainly aren't today. The display has grown up to 4 inches, taking the pixel density down to 184 ppi. With some rival smartphones able to offer nearly twice this number, the 808 PureView has no excuses. But not everything is ruined. AMOLED offers great sunlight legibility and perfect indoor performance. Not least, the aspect ratio is spot on 16:9. Deep blacks and saturated colors are the technology's trademark features. Although it's not as impressive as Samsung's SuperAMOLED Plus, it's more than competitive elsewhere. 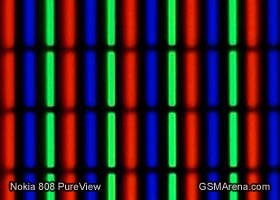 And here's how the Nokia 808 PureView did in our dedicated display test. We couldn't measure the values at 50% brightness since the ambient light sensor couldn't be turned off. You can learn more about the testing process over here. We conducted our usual sunlight legiblity test on the Nokia 808 PureView and it ended up our new champion. The contrast ratio of the ClearBlack AMOLED mounted on the smartphone in strong light is way better than anything we've seen so far. We zoomed into the display using our digital microscope so you can get a better idea of how the pixels are arranged, and how big they are. Check it out. Below the display is the classic layout of Nokia Belle buttons - call keys on either side of a Menu button. They all share a single piece but the three keys are solid on press nonetheless. There's no hardware back button, soft key is the only way to go. The right side of the phone packs the volume rocker, the screen lock slider and the dedicated camera key. All of them have a kind of metal finish and feel great on press. The camera key is very soft upon a half press, getting a bit stiff to push all the way down. We like it that way and we're even more impressed with the speed with which the camera responds. Pressing the shutter key with the screen locked launches the camera in a mere second. The left hand-side doesn't feature any controls or ports. The left side of the phone is clean from buttons. To make up for this, the top side of the phone accommodates all the ports. There's the 3.5mm headphone jack, microUSB port for charging and data transfers and the microHDMI port for streaming to an HDTV or a monitor. The latter is hidden under a rubber lid to keep out dust. The bottom of the 808 PureView holds the microphone pinhole. It's also responsible for recording sound for the excellent videos the camera is making. But more on that later on. 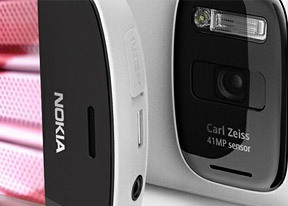 The natural attention-grabber is the 41MP imaging sensor with PureView technology at the back. It sits in a large hump sharing the space with a large Xenon flash. The optical module is made of five elements, and the image sensor is massive. It's way bigger than the N8's, which in turn is way bigger than usual. The Xenon unit too needs plenty of space, so in the end, Nokia could've done a lot worse than the camera bulge at the back. That's where the loudspeaker grille is as well. At the bottom of the back panel there's a thin ridge, which is probably supposed to help with grip, but we found it to be purely ornamental. Maybe at some point they were considering a proper digicam-style grip but decided against it to avoid comparisons to the Samsung Pixon. Removing the back cover reveals a standard 1400 mAh Li-Ion battery quoted at 6h 50 min of talk time and up to 540 hours of stand-by. The SIM compartment and microSD card slot are under it. The battery cover itself has an integrated NFC chip. 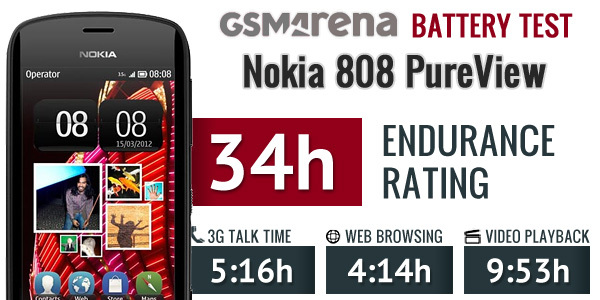 Update: We ran our traditional battery test on the Nokia 808 PureView. It scored an endurance rating of 34 hours, with an impressive result in video playback and a decent web browsing result. In our talk test the phone lasted less than the advertised nearly 7 hours of talk time, instead depleting its battery in 5 hours and 16 minutes. You can find more details on the 808's battery performance over here. All in all, you can tell the Nokia 808 PureView is built around the camera. The design simply follows suit. It may sound hard to believe for a rather chunky and heavy handset, made entirely of plastic, but Nokia are at their usual best with the build quality of their cameraphone flagship. The screen resolution is a bit of a low point but by no means a deal breaker. It's AMOLED after all. Many will find the camera bump rather ugly, but we think it adds to the phone's personality. Not exactly our ideal picture of a handsome phone, the 808 PureView feels rock solid and is more comfortable to handle than most would think. Follow us past the break to see how Nokia Belle with Feature pack 1 fits into the equation.